Add white whole wheat flour to a large ziplock bag with zucchini slices. Toss to coat. Add Silk Cashew milk to medium bowl, set aside. Add panko, dry basil, and garlic powder together. Set aside. Add coasted zucchini to milk and then to panko mixture. Be sure to coat and press down on both sides so mixture stays on. Add 1/3 cup of grape seed oil to pan, add in coated zucchini chips. Saute for 4-5 minutes per side so it is slightly browned. Remove and place on paper towel coated plate. Add in the rest of the grape seed oil and the rest of the zucchini chips. Cook for the same amount of time. Remove and place on plate when finished cooking. In a large bowl add, diced cherry tomatoes, fresh basil, balsamic vinegar, olive oil, garlic cloves, and salt to taste. Toss to mix everything. 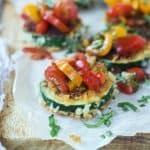 Serve Zucchini Chips with fresh Bruschetta on top.